Every once in awhile, something comes along that is simply brilliant in its simplicity. For ASUS, that time could be now. ASUS plans to continue in their tradition of early adoption of new chipsets with a mid-February release of their upcoming Rampage Formula motherboard, a board that will make use of Intel's recently announced X48 Express chipset and DDR2 memory. Although DDR3 has been available for purchase for many months now, exceedingly low DDR2 prices have made purchasing 4GB or even 8GB of memory quite affordable - the latter still costing less than 2GB of good DDR3 memory. Coupled with the fact that the Rampage Formula provides a relatively easy upgrade path for current DDR2 owners, we can see why this board will be an attractive choice for anyone looking to build their next high-performance gaming system. Like other recent offerings from ASUS, the Rampage Formula is part of the Republic of Gamers (ROG) line of motherboards, aimed squarely at the enthusiast looking to tune all levels of system control in order to extract every ounce of possible performance. We were a little surprised to see that ASUS seems to have needed very little engineering work in order to make use of Intel's higher-binned X48 chipset - the Rampage Formula and the currently available Maximus Formula (which uses the X38) share almost everything in common with the exception of the Northbridge. On one hand this makes sense, as the X48 is little more than an X38 binned for ultimate performance; on the other hand we would have liked to see a few additional improvements in component choices and layout. Because of this, those that already own an X38 ASUS motherboard may find no compelling reason to upgrade. However, gamers ready for a complete system overhaul looking to build with the absolute best quality board should strongly consider the Rampage Formula. Compatibility was excellent with no real gripes to speak of - the board flawlessly made use of every CPU and memory kit we installed for testing. 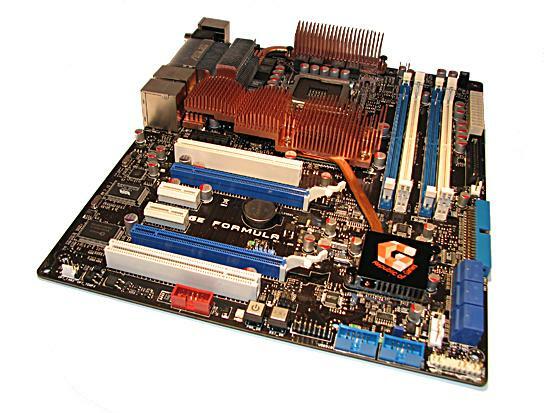 Coupled with one of Intel's new 45nm quad-core or dual-core CPUs and a pair of ATI 3000-series Radeon cards in CrossFire, this board provides a solid centerpiece for a formidable gaming rig. We would be delinquent in not noting the impending release of the Rampage Formula's DDR3-based companion, the Rampage Extreme. We anxiously await our chance to bring you an early first-look at what it has to offer. We fully expect that it will best even the most refined X48/DDR2 board. Our experience has always been that the X38/X48 chipsets simply work better when teamed with DDR3 memory. For whatever reason, we find that for absolute ease of overclock and rock-solid stability nothing beats an X38/X48 DDR3 board. Unfortunately, DDR3 prices can be a rather large obstacle for some, especially when dealing with the higher speed bins. For now, we are happy to report that our early dealings with the ASUS Rampage Formula have been extremely satisfying, especially considering the relatively short amount of time given to BIOS maturity. In fact, we feel there are no significant obstacles impeding the release of this board. Additionally, we must applaud ASUS for the industry-leading effort they have put forth in incorporating a few new settings into the BIOS that give the user the ability to easily unlock otherwise hidden memory performance with just a quick finger twitch. What are these settings you ask? Simply put, the ability to select a MCH Read Delay (tRD) from within the BIOS, as well as a means for adjusting the timing of each individual memory phase associated with the selected memory divider. You may know this setting by its more common name, often referred to as "Performance Level". While some motherboard makers have been making use of these settings for quite some time, never before has it been as de-obfuscated as it is today. Hopefully we can finally say goodbye to the frustration of blindly adjusting these settings with the hopes of achieving the desired end goal - an accomplishment we can all appreciate. Our hopes are that other vendors follow suit and work quickly to update their offerings to provide this level of control in a similar manner. For those that are interested, we will touch on the performance improvements that can be seen as well as the other implications involved with making use of these settings a little later on. With X48, the tier one giants - ASUS included - are gearing up for another round of lightning-fast motherboard releases. It appears as though they are now simply waiting on the green flag from Intel before they release these boards to the world. The fickle-free operation and high probability of success when overclocking that comes with teaming an Intel processor with an Intel chipset makes picking up an ASUS Rampage Formula an easy choice. One thing's for sure, ASUS is on a roll, and they don't appear to be slowing down for anyone. Or should i go for a different setup? If i understand correctly, this is possible.. I made the calculation, and the answer of the Question if it is possible Yes or No, is 1,67 > 1,33. 1,67 is higher than 1,33. So yes.. I realise this article is quite old now, but found it very useful for tuning my Rampage Formula. Have achieved significantly increased memory performance from this setting. The board seems to configure them fairly well on the auto setting, but there are some cases where manually tweaking them can give a good performance boost. I am curious about one thing - I would have thought that running a 1:1 divider would allow the lowest tRD value as the two clocks are running at the same speed. Data should be able to be passed between the two buses without delay, whereas if the memory clock is running faster, it might need the delay to prevent 'overlapping' with the previous data transfer. However, according to the formula (and indeed a couple of quick tests confirm it), a 1:1 divider is actually the worst for tRD, the wider the ratio the better. Wow, I just learned alot, I think. Very nice article! Well written and presented. You know, this is only one of many reviews for this board, and only one of many on this forum. Try some more searching, and maybe educate yourself more before calling most of this article "Crap". This is probably one of the most useful articles on this motherboard I have found. With all these new options open to ROG owners, i'm glad someone is taking the time to explain what they mean and why we have paid for them. I am very new to this stuff and havent been able to make a lot of sense of the configurations despite reading the article several times. What sort of configuration should I apply? I dont know if I've done something wrong but for some reason, 3dMark is showing the memory at 1.9 Ghertz. It's a DDR2 rated at 1066 and I am running it at (according to my calculation) 1000.